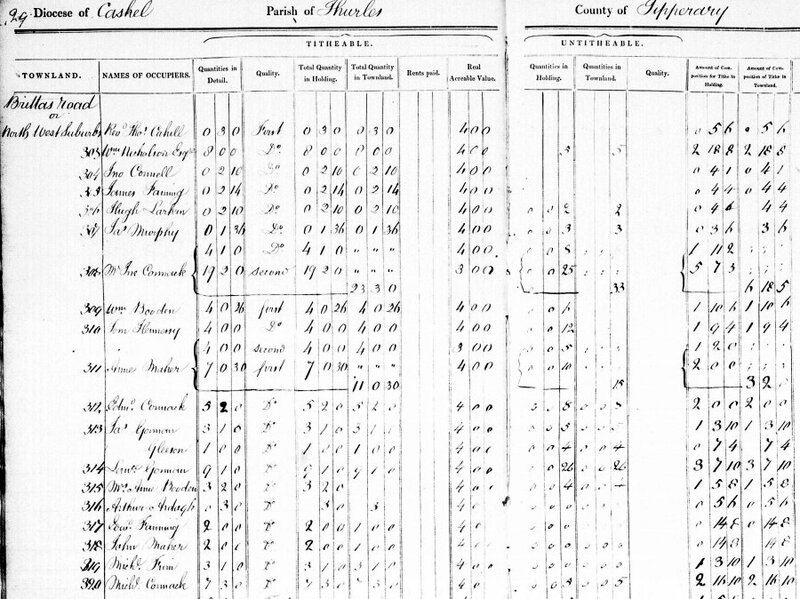 Have you hit a brick wall in your genealogical research? 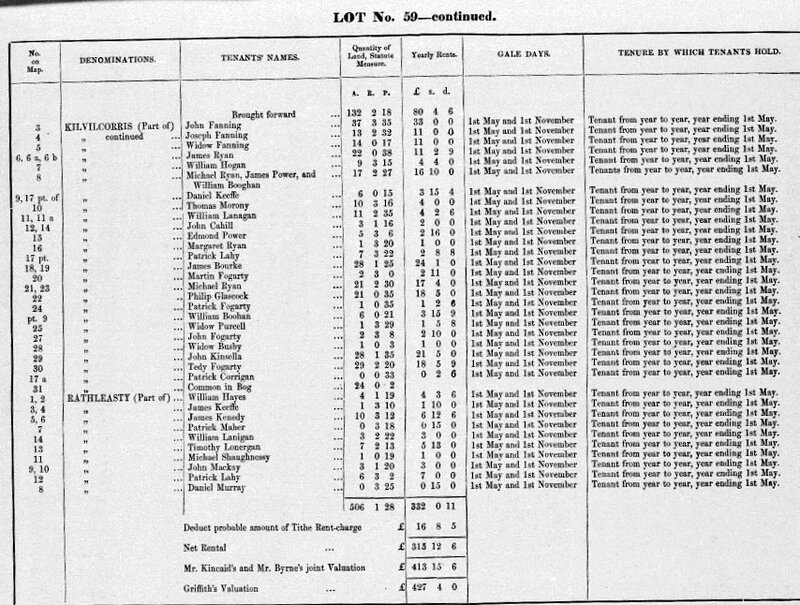 Or do you want to confirm your paper trail results? Consider DNA testing! There are points in everyone’s research, particularly along the patriarchal line, where DNA testing can be very helpful. Family Tree DNA products and prices are listed here. They do have specials every now and again, as these tests are not cheap. 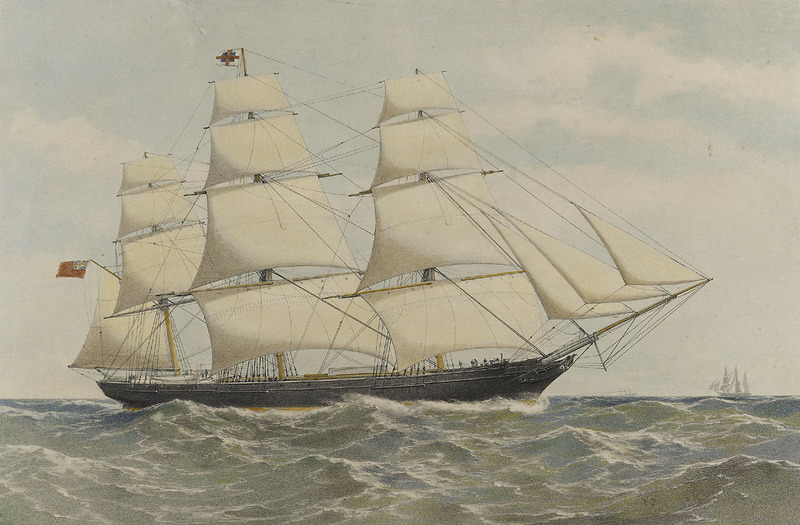 The largest Fanning/Fannin DNA project available is hosted by Family Tree DNA at https://www.familytreedna.com/groups/fanning/about . 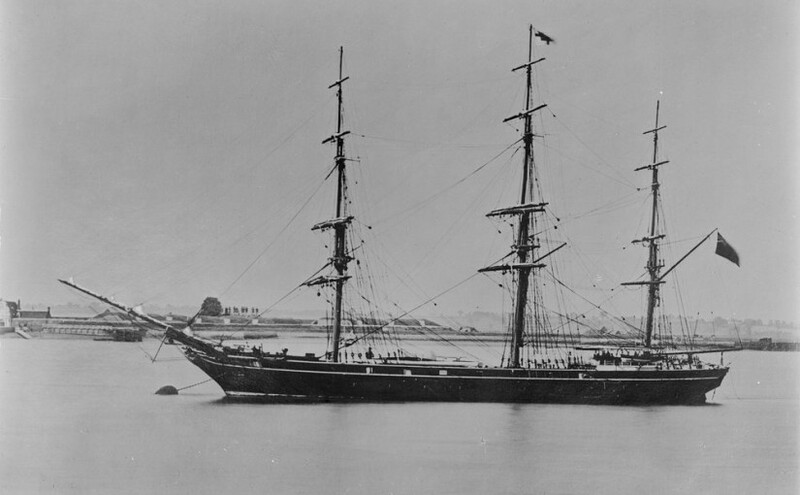 If you are interested in DNA testing to aid your genealogical research, please check out this project and contact the admin team for questions. At Family Tree DNA they are particularly interested in getting more Australian male Fannings to test. 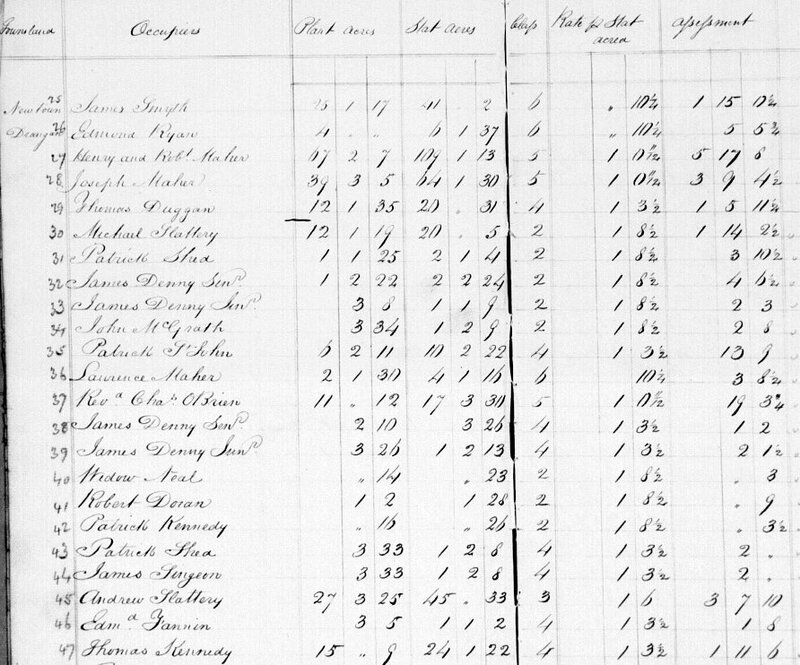 The more people who get their DNA tested for genealogical research the more connections can be made. 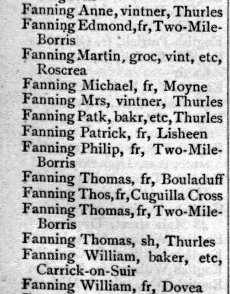 In Thurles there was also Mrs Fanning in Quarry Street, the niece of my great great grandfather, William Patrick Fanning, who emigrated to Victoria in 1841. 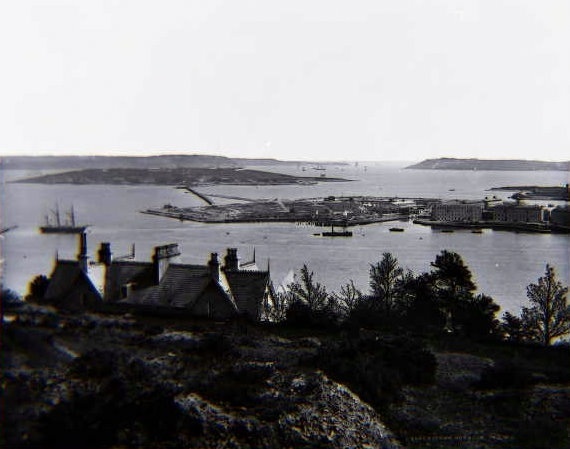 Edmond Fanning of Coolcroo; Philip Fanning of Coldfields and Thomas Fanning of Skehana. 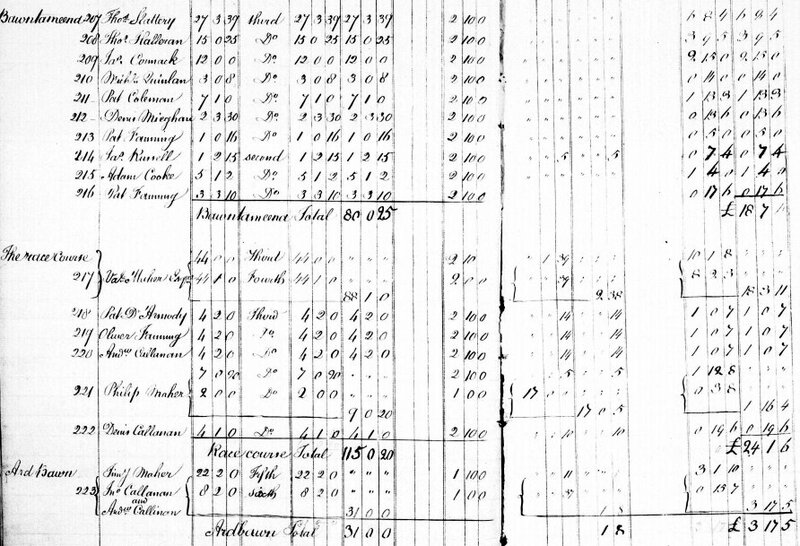 The Tithe Applotment Books cover the period 1823-1837 and record the amount of tax payable from the occupier of land to support the Protestant Church of Ireland. A very unpopular tax. 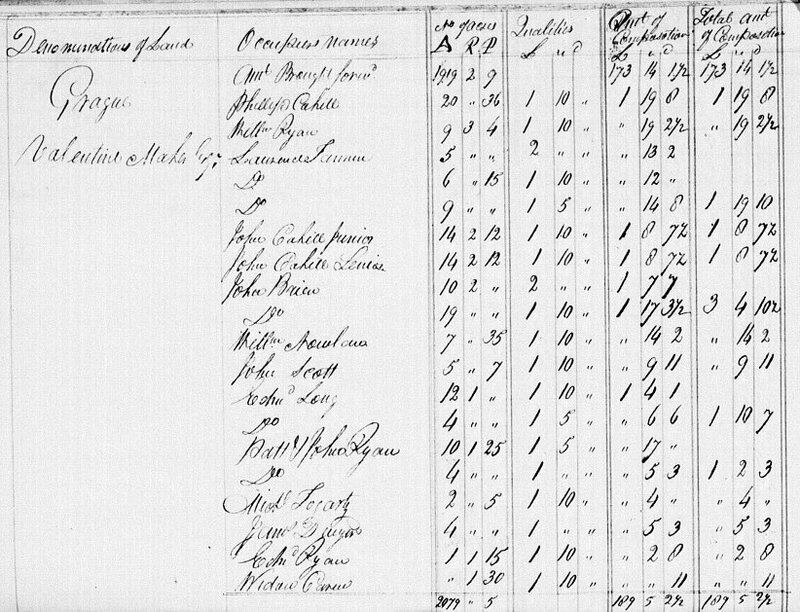 The Tithe Applotment Books are now online at The National Archives Site. 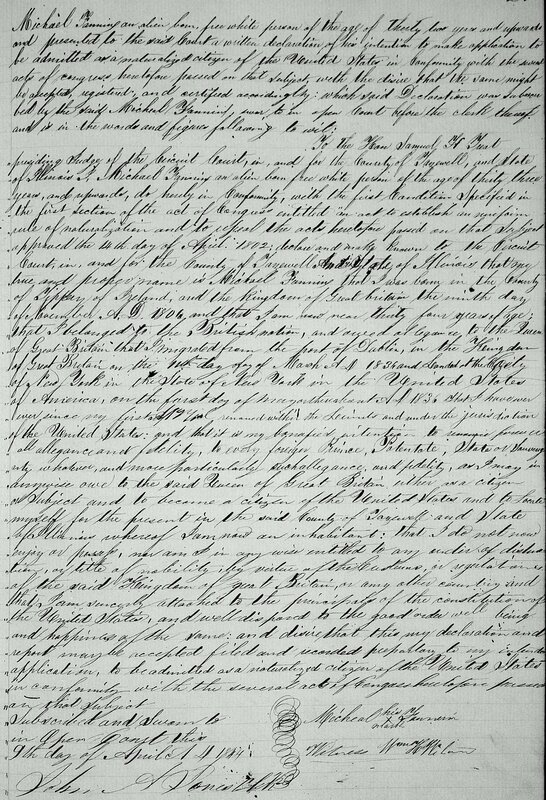 There are many transcription errors, so check the original document carefully. 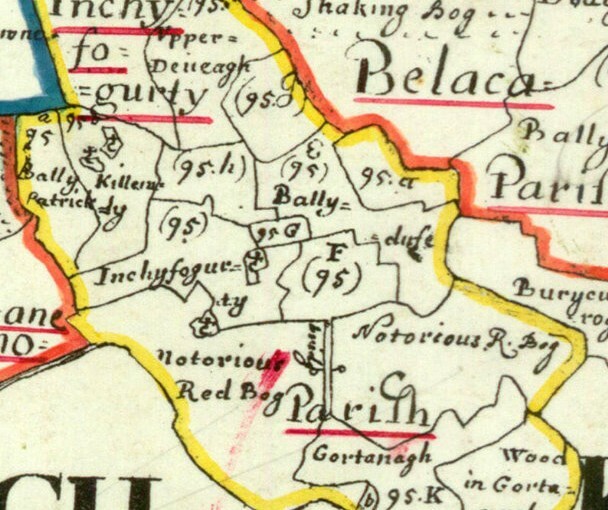 The books are arranged by townland and list the name of each land occupier, the size and quality of their land and the tithe due. 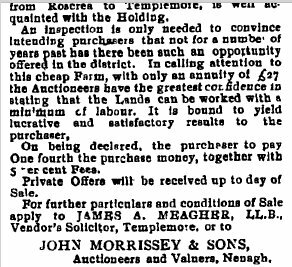 By comparing what your ancestors paid to that of their neighbours in the same townland you can get an idea of how well off or not they were. The tithes were only paid on agricultural land. 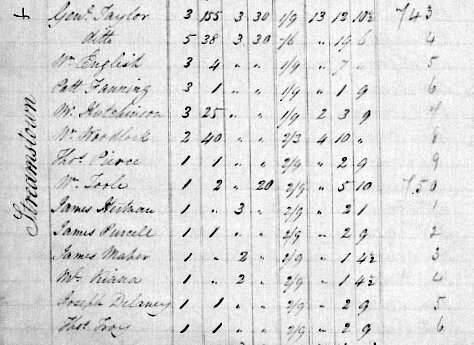 In the 1830s many refused to pay these taxes and there are lists of these Tithe Defaulters on Irish Origins, a fee paying site. 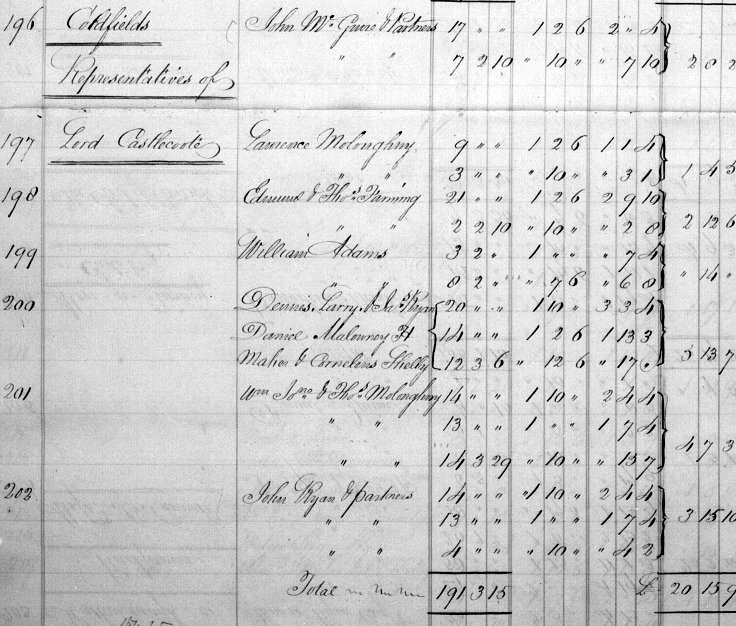 In this post I have included Fanning and Darmody Tithe Defaulters. 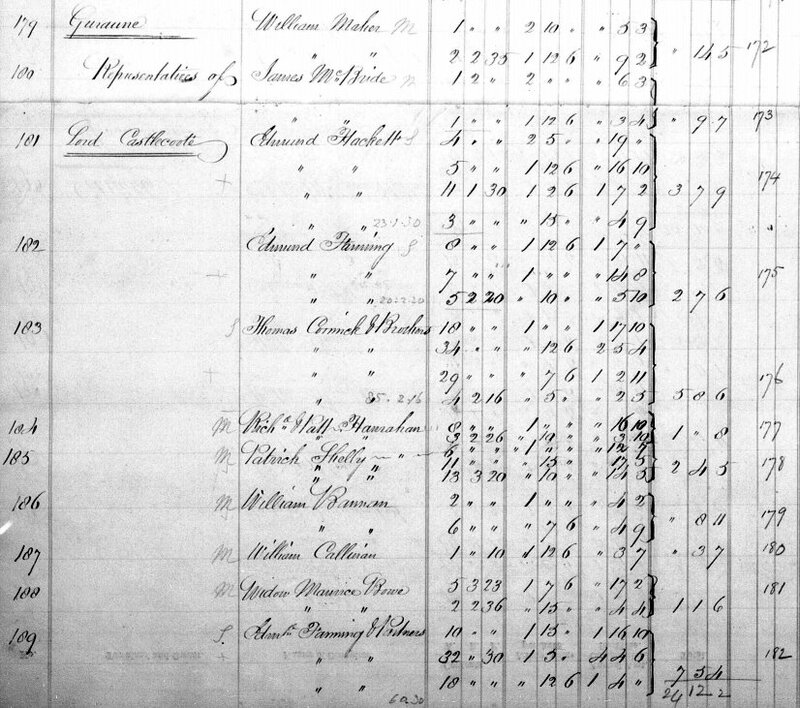 Tithe Applotment Book entry for William Fannin of Lissaroon, my ancestor. 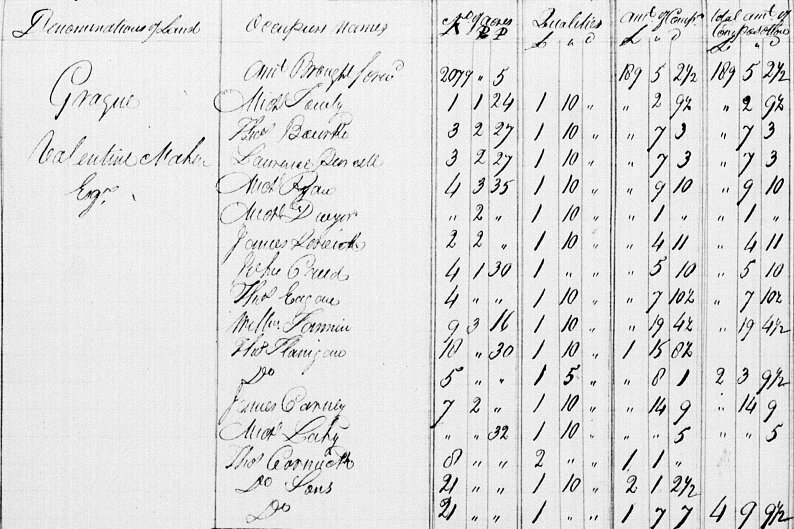 There is another entry for a John Fannin of Gurtadangan but I think it is a duplication. 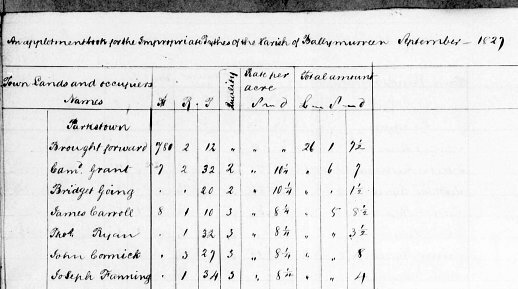 The following entry was listed incorrectly as Edmond Hannin but I think it is Edmond Fannin of Buckley Islands which is in Inch Civil Parish. 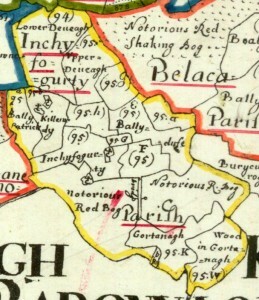 Given that he is in Inch Parish he is most likely part of my family. 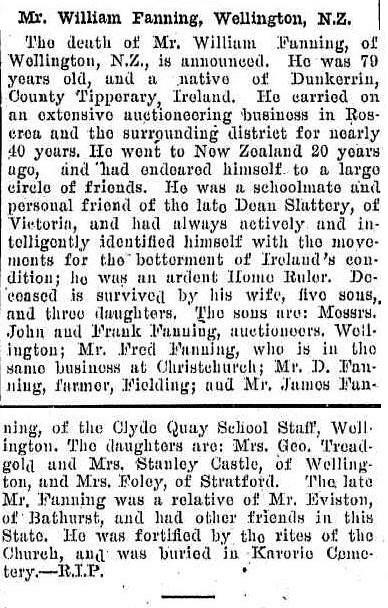 I don’t see two other Joseph Fannings in Parkstown so I think this is a duplication. 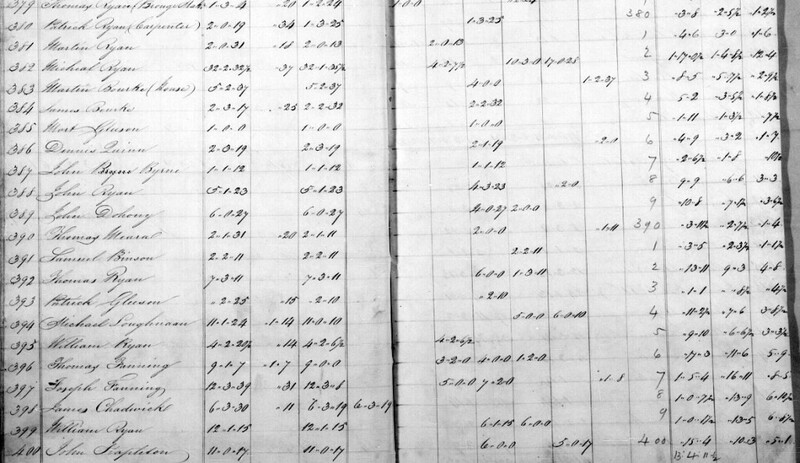 Checking the entries for this Joseph Fanning of Parkstown there appear to be two handwritten copies of the same records which may account for some of the transcription errors. I think that this should be Killvacorus. Also there is an Edmond Fanning senior and an Edmond Fanning junior listed. 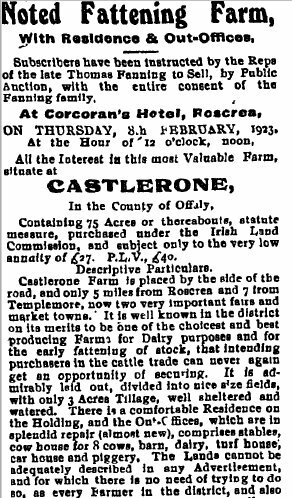 The second entries for Edward Fanning of CarrigLoughmoe, Michael Fanning of Killeenleigh and John Fanning of Clondoty are duplicates. 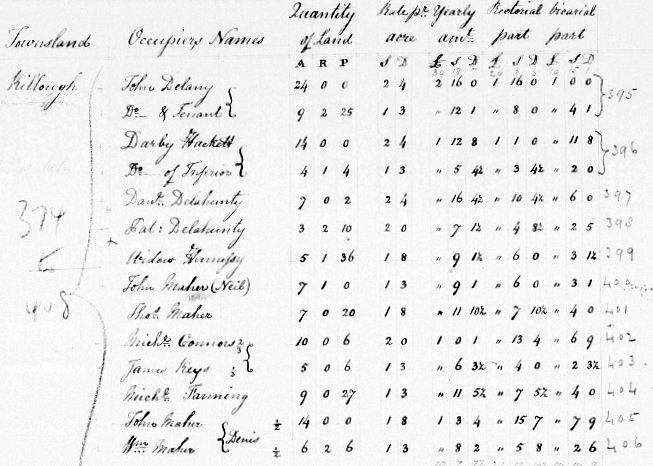 In the above entry Edward has been transcribed incorrectly as Low Fanning. 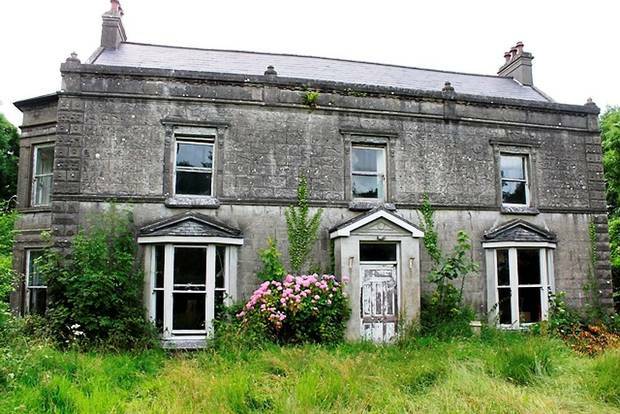 In the two above entries the owner, Lord Castlecoole, was incorrectly entered as the townland. 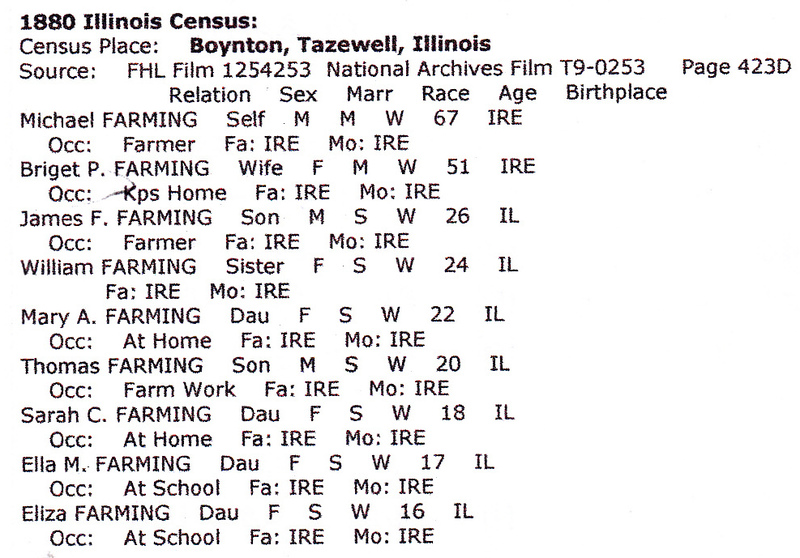 Michael Fanning of Boynton & Delavan Tazewell Illinois, brother of William “Big Bill” Fanning? 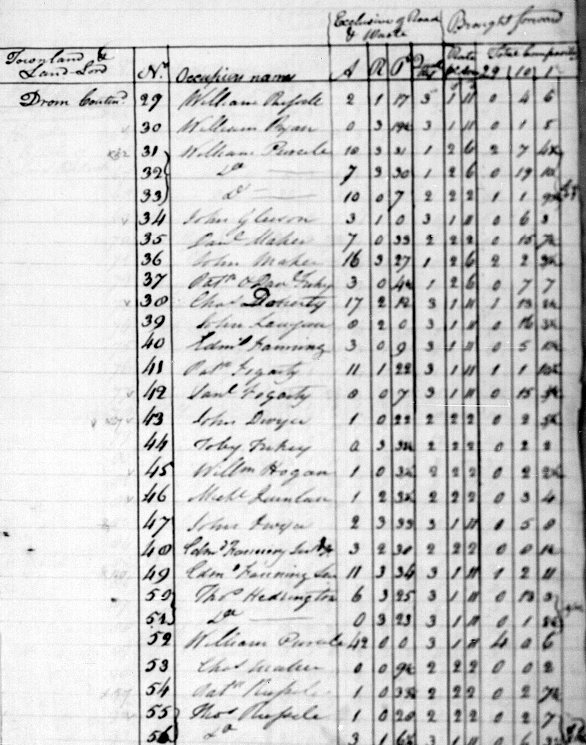 Is Michael Fanning born Co Tipperary Ireland 1810 and died 1900 in Tazewell Illinois the brother of my gggrandfather William Patrick Fanning of Thurles Co Tipperary Ireland and Bulla Victoria Australia? 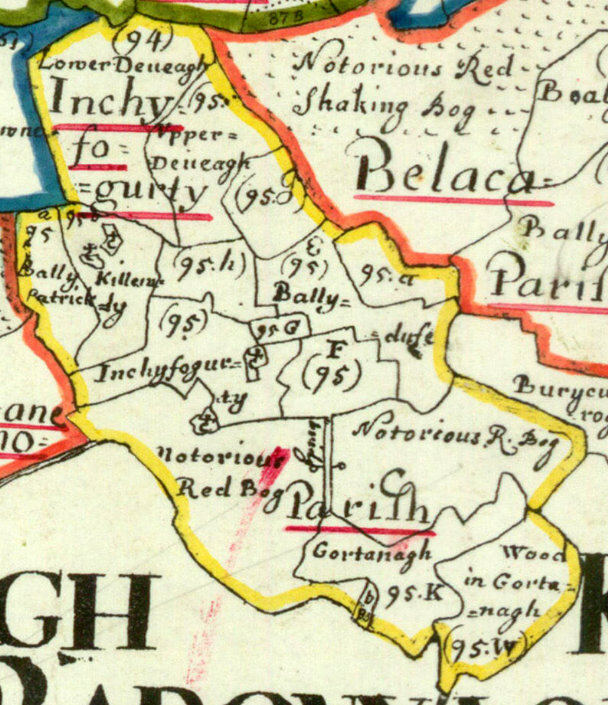 A few years ago I was contacted by a fellow family historian about Michael Fanning and possible connections with her Keyes ancestors who lived in Paterson, Passaic County, New Jersey, USA but originally came from Co Tipperary and Co Leix in Ireland. 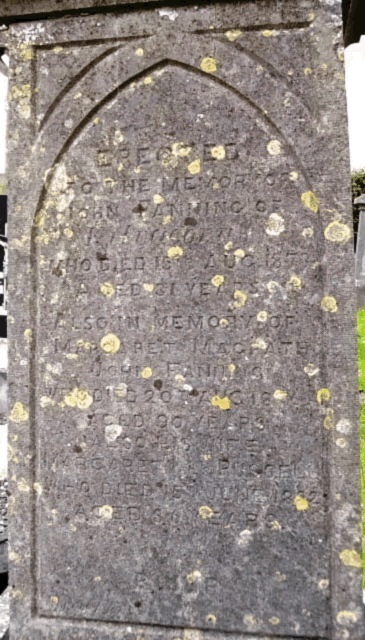 She told me that a Michael Fanning had married Catherine “Kitty” Keyes in Co Tipperary about 1833. 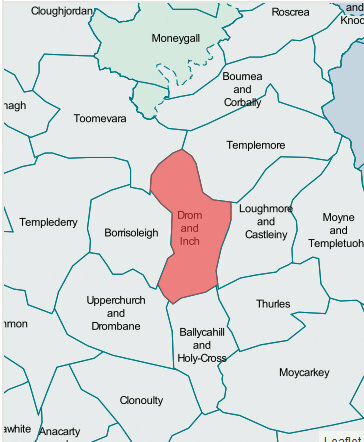 They lived in Dromard (Dromard More or Dromard Beg) civil parish of Killavinoge (Templemore), Co Tipperary It is said the Fanning family lived in Dromard around this time. 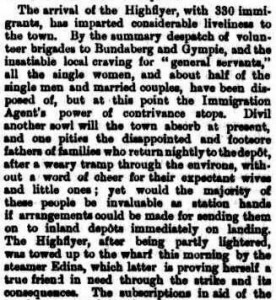 A Michael Fanning was sponsor to Ellen Keyes 6 Mar 1835 at Graffin (Knockgraffin?) and may have been Edward’s father. They had two children. 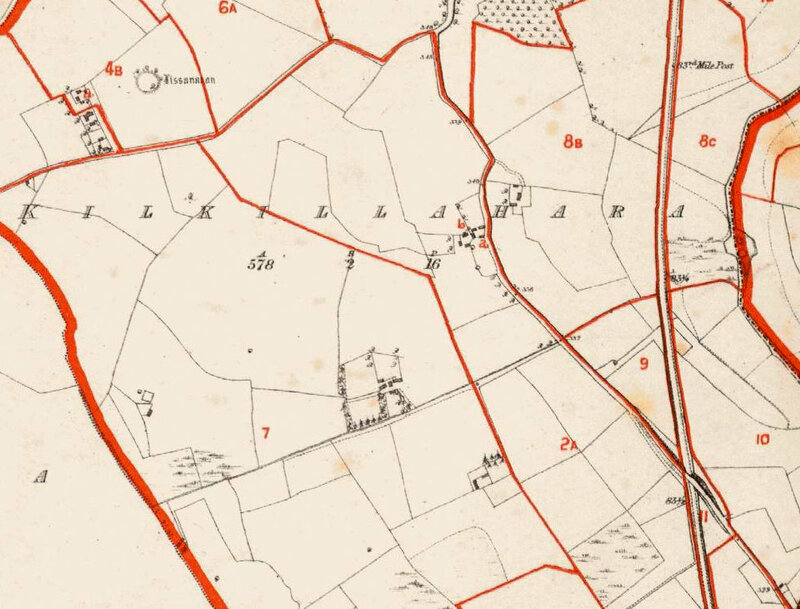 Edward was baptised at Clonmore in the Catholic parish of Templemore on Dec 28 1833. 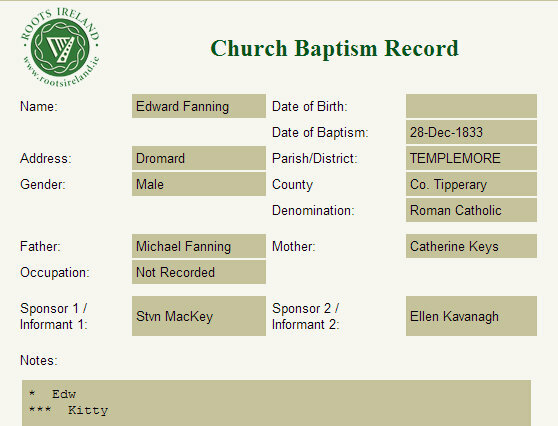 The baptismal sponsors for Edward were Steven Mackey and Ellen Kavanagh. 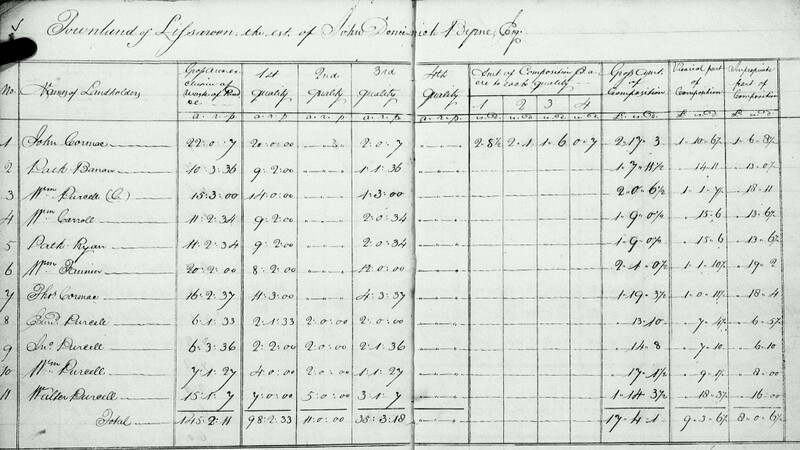 John the second child was baptised 22 May 1836 (sponsor- Judith Keyes). 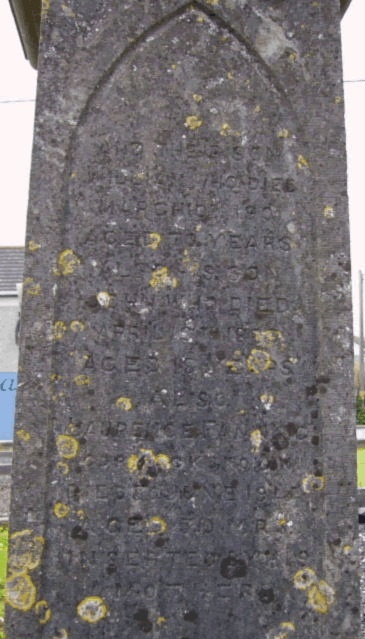 He is said to have died young in Ireland. 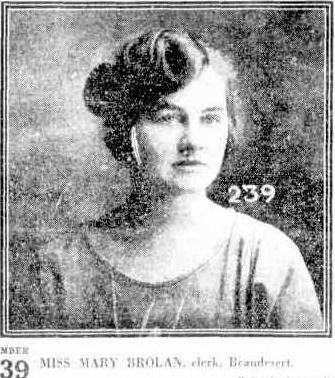 His mother Catherine “Kitty” Keyes also died young. 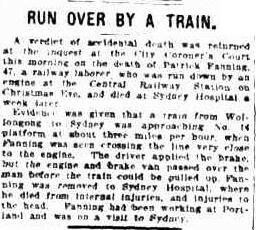 “FANNING – In this city on Thursday March 8 1900 Edward, beloved husband of Sarah Fanning, aged 66 years. 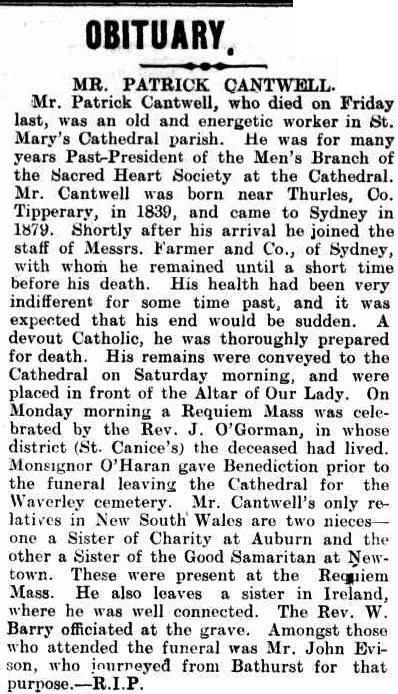 Relatives and friends of the family are invited to attend the funeral on Monday, March 12, 1900 from his late residence, 138 Jersey street, at 9 o’clock a. m. and from St. John’s R. C. church at 9:30 o’clock a. m. Interment at Holy Sepulchre. Recently I was contacted by members of the Brophy family and they sent me what they know about Edward Fanning. Timothy Brophy, a great grandson of Edward, has researched his family history and published a book,The Brophy Lane Chronicle, which he kindly sent me. 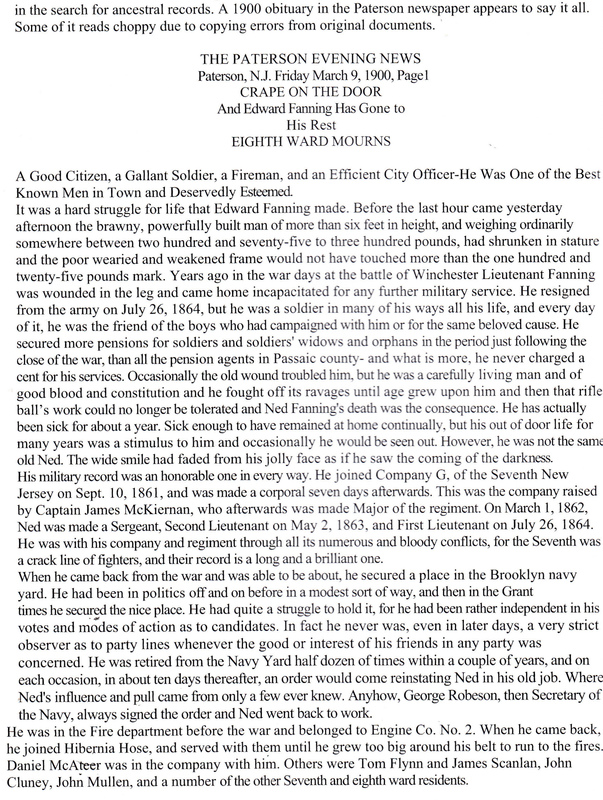 Below are three pages from this book which relate to this Edward. 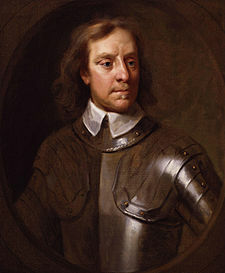 I have also included a photo of Edward’s son, also Edward. 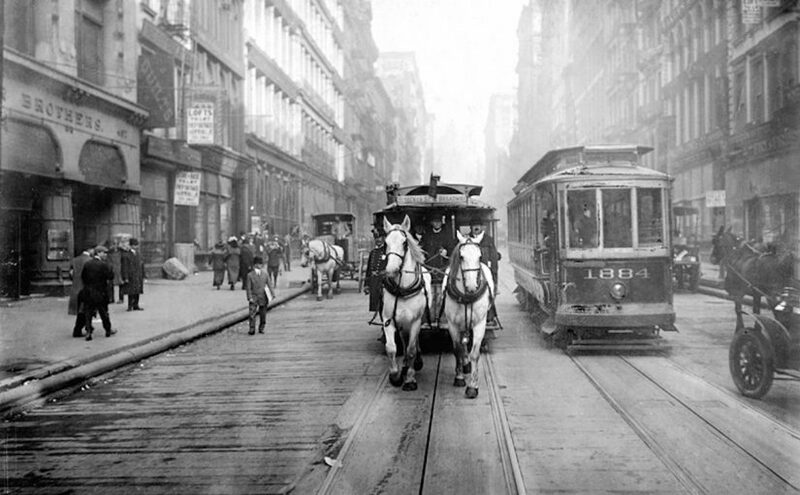 Edward Fanning was an excellent carpenter and contractor. 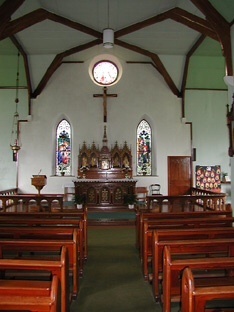 He designed and built the very intricate and beautiful altar woodwork in Paterson’s Saint John’s Cathedral. 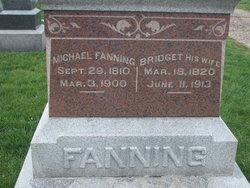 He was the grandson of Michael Fanning and Kitty Keyes. 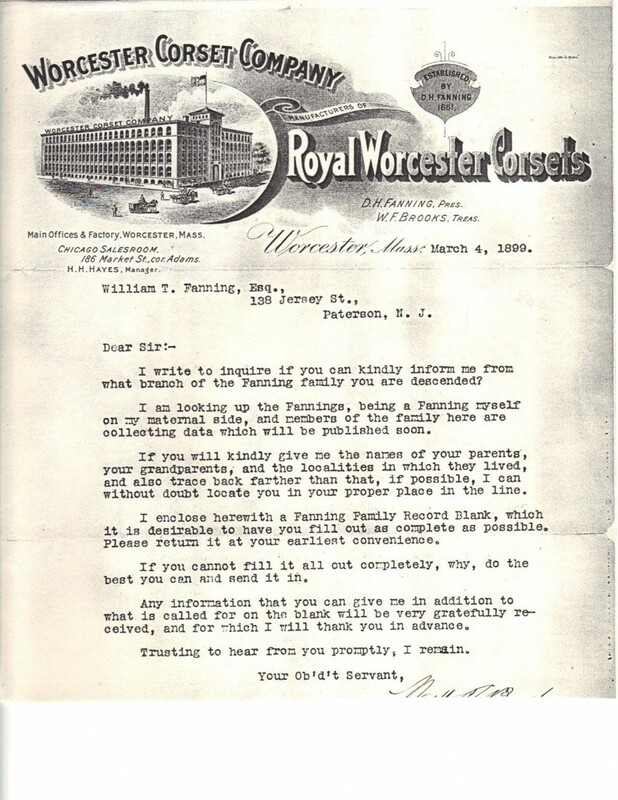 Letter sent to William Fanning by Walter Brooks who was researching Fanning family history for his book. This letter was sent to William T. Fanning (1875-1925) in 1899, he was Edward’s son and Michael’s grandson. . 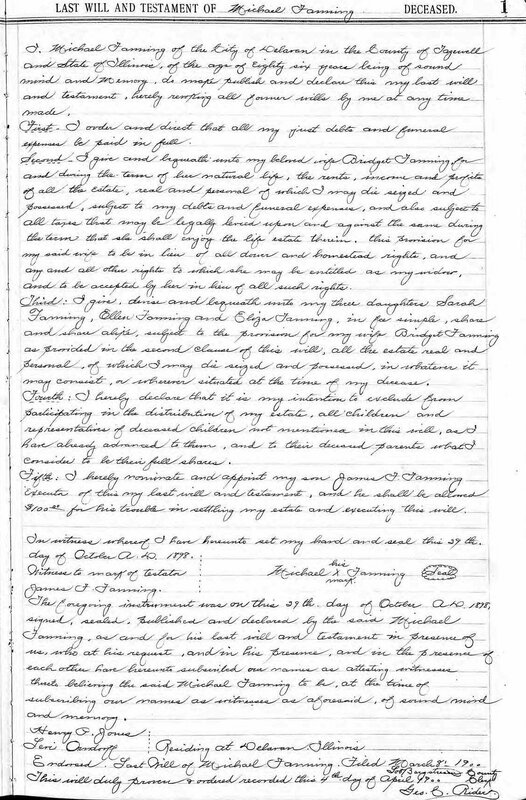 This was one year prior to the death of William’s father Edward Fanning (1833-1900) so we can assume the father and son talked about completing this document together. 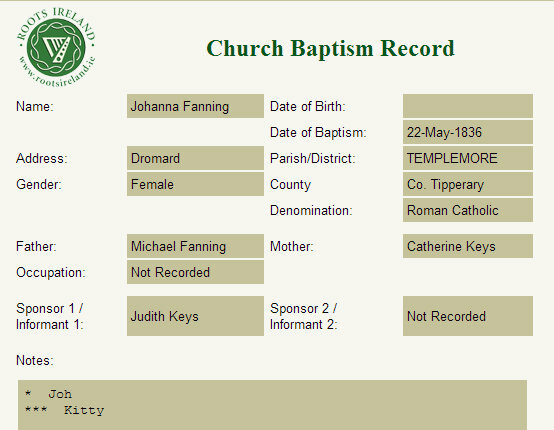 It lists Michael Fanning and Catherine Keyes as Edward’s parents and Ed Fanning and ? Darmidy as his grandparents. 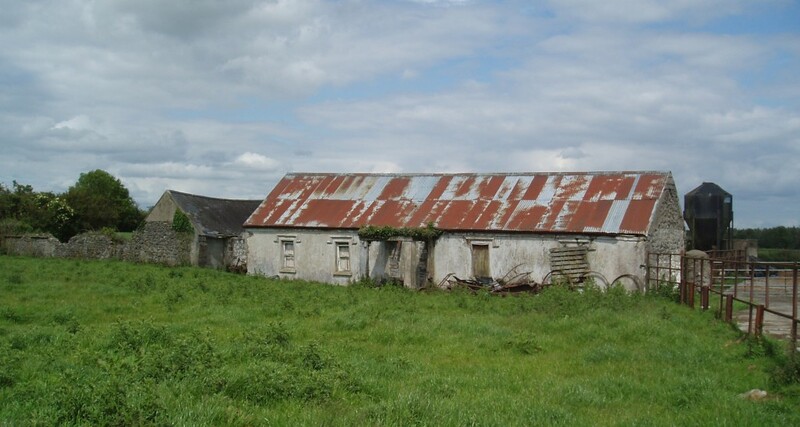 The place of birth is listed as the Parish of Clonmore, Tipperary, Ire. 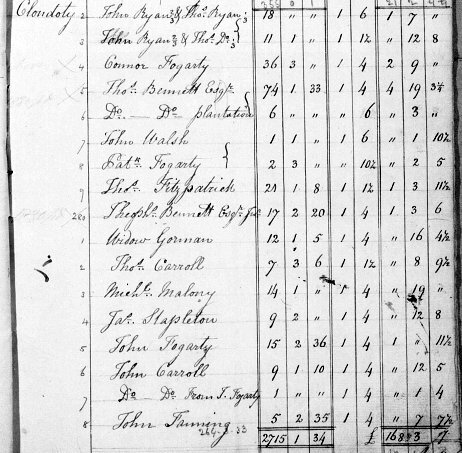 Dec. 24, 1834. 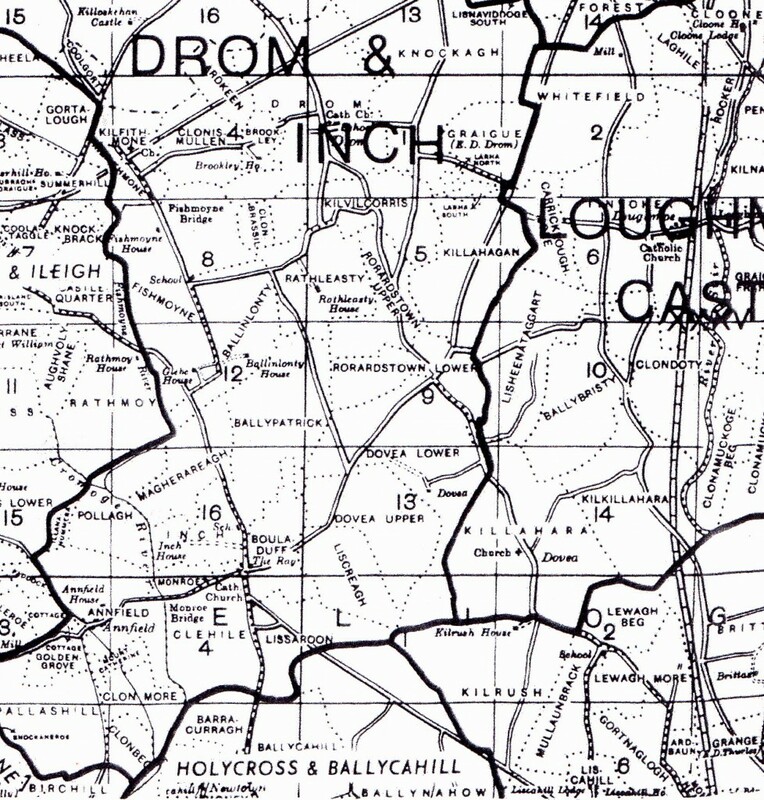 Clonmore is an alternative name for Killovinoge. 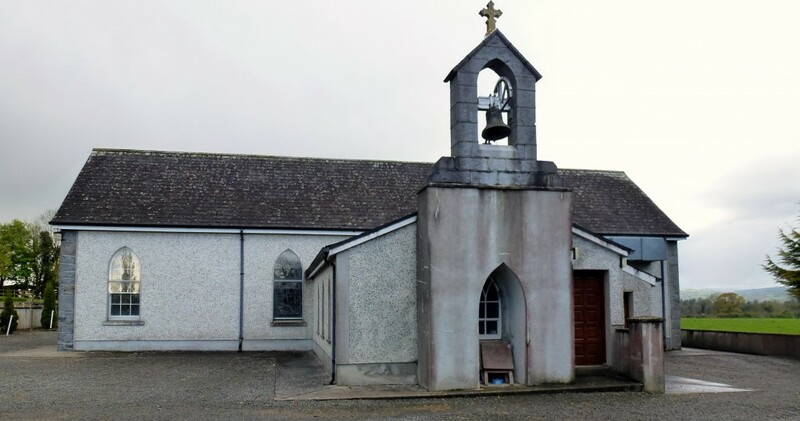 Templemore is the more well known name for this parish. In the past I commissioned research with Tipperary Family History Research into Edward Fanning and Johanna (Judy or Judith) Darmody and there were only two Fanning Darmody marriages in Thurles Parish. 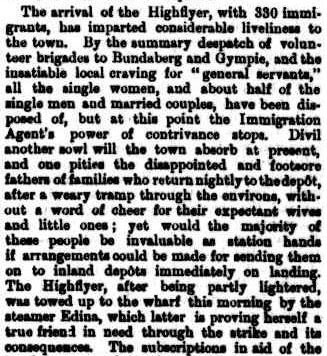 One was Ed Fanning and Johanna in 1808 and then Patrick Darmody married a Catherine Fanning in 1840. 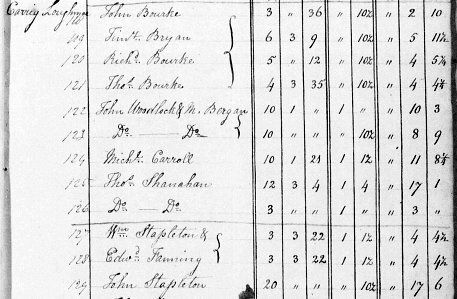 I think this pretty much proves that the Edward Fanning living in Paterson New Jersey was the son of Michael Fanning my gggrandfather’s nephew. But whether the Michael Fanning from Tazewell is his brother is a little harder to prove at this stage. 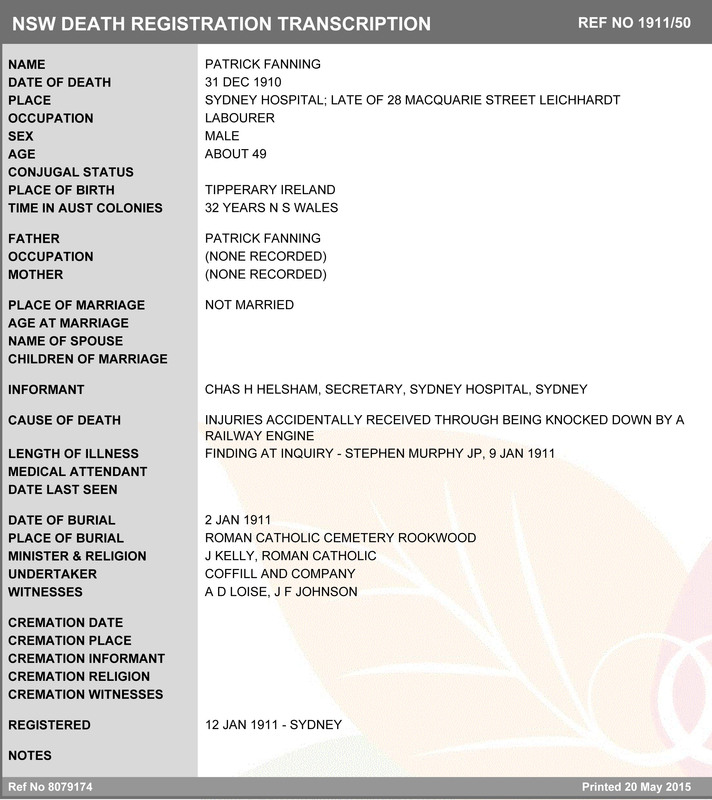 I also asked for any marriages of a Michael Fanning that might be relevant. 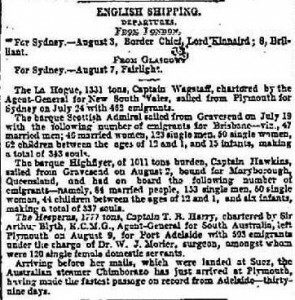 None of the marriages that TFHR came up which seemed likely. However, they also didn’t not come up with the marriage of Michael and Kitty Keyes, which is odd. 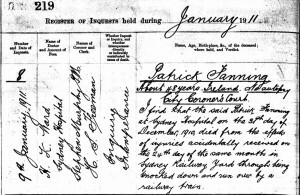 I have since found their marriage record through Rootsireland.ie. 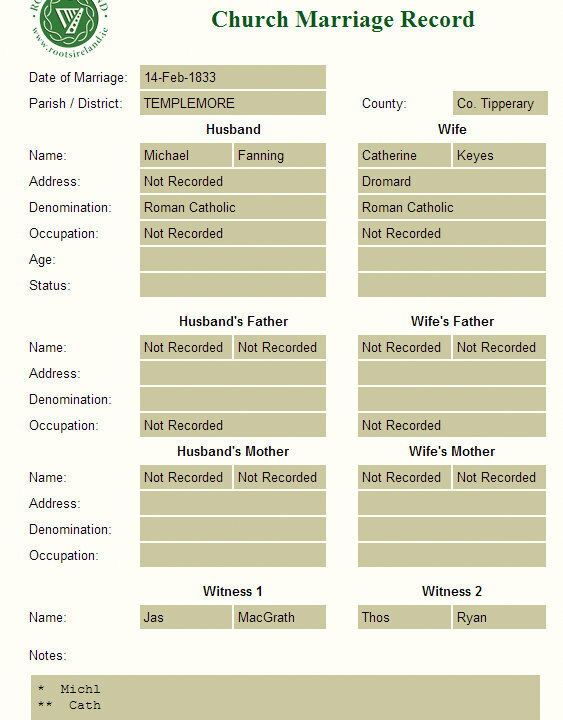 They were married in the RC parish of Templemore on 14 Feb 1833. 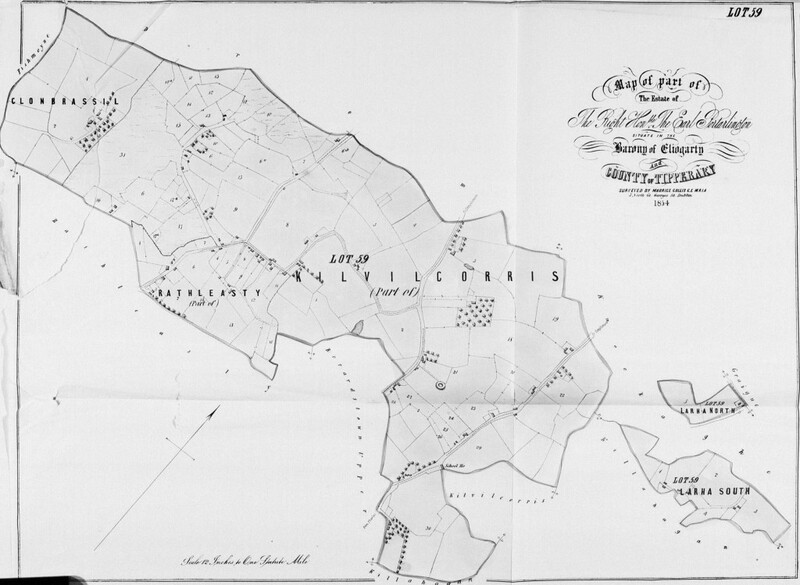 Catherine’s address is given as Dromard. Unfortunately there are no fathers’names or an address or occupation for Michael. Very Frustrating. Witnesses were James MacGrath and Thomas Ryan. 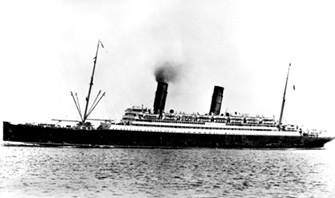 They had two children, Edward and John. 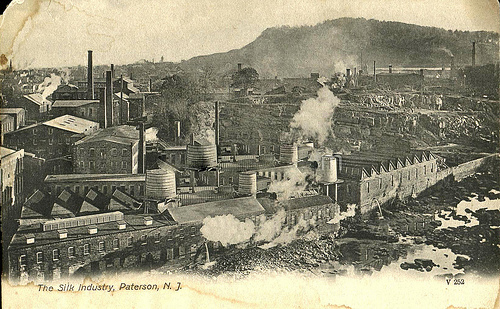 Edward ended up in America and lived in Paterson New Jersey.which is about 900 miles east of Delavan Tazewell Illinois. 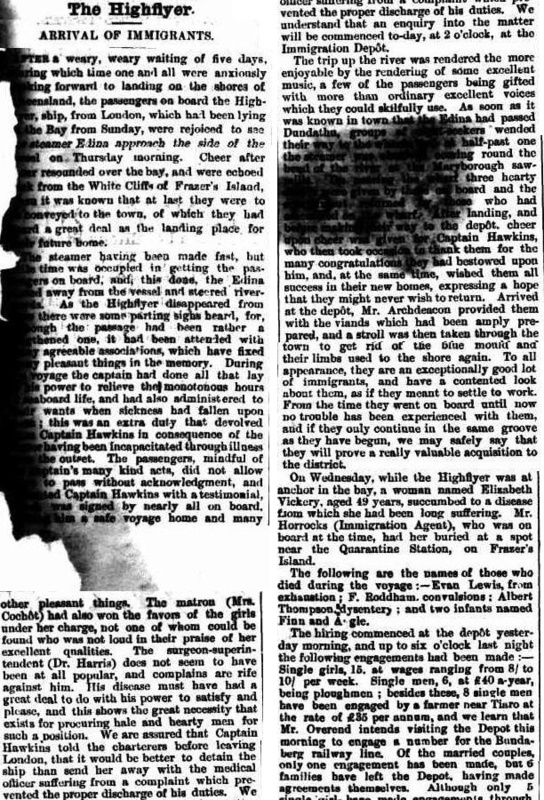 I checked the microfilm and the entry looks very much like Joanna so maybe the story of their being a younger brother John is inaccurate. 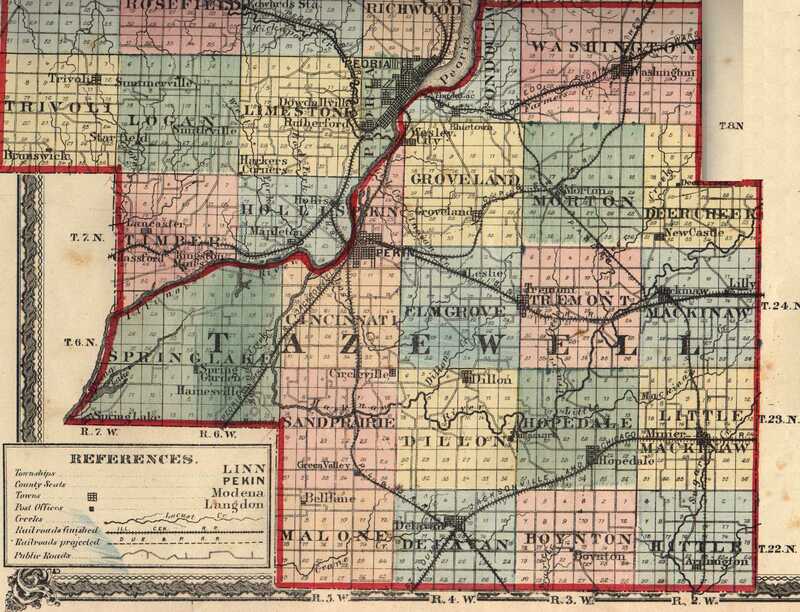 Another source stated that Edward’s father married again to Bridget Phean (Feehan) and lived in Delavan, Tazwell Co Illinois. 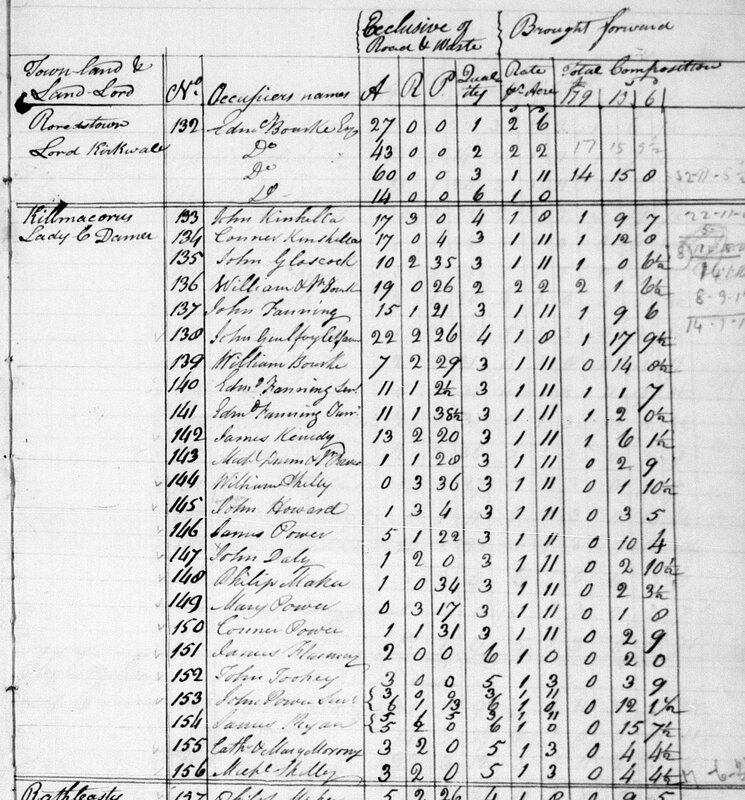 Michael Fanning applied to become a US citizen on April 9, 1844 in Tazewell Co Illinois. 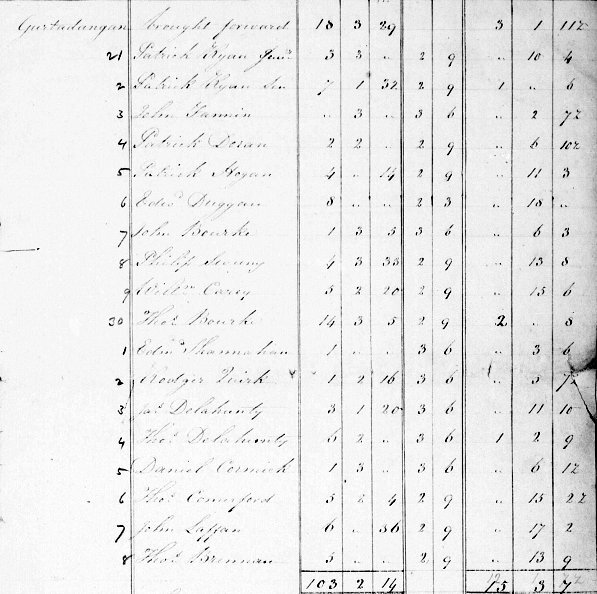 This document which is very hard to read lists his birthday as November 9, 1806 and that he left Dublin Ireland on March 11, 1836 and landed in New York on or about May 1, 1836. 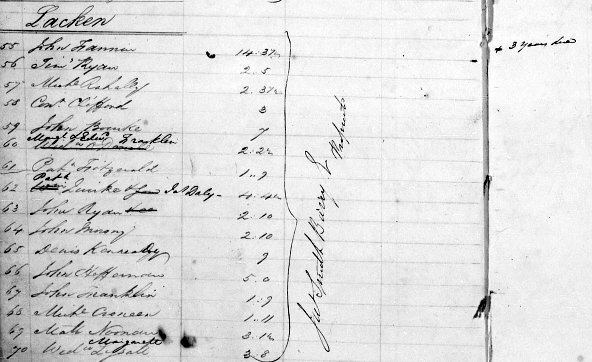 Michael could not write and made his mark on the document. 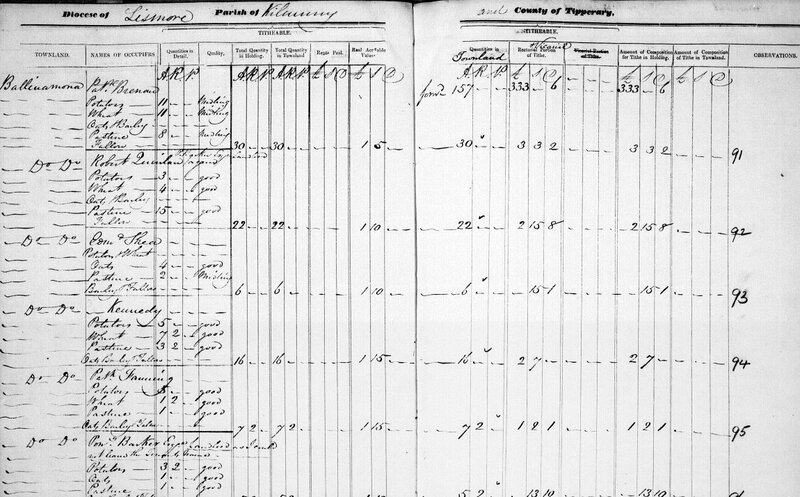 Michael Fanning (Fannan) and Bridget Feehan (Fahan) were married on 22 Feb 1852 in Tazewell county. 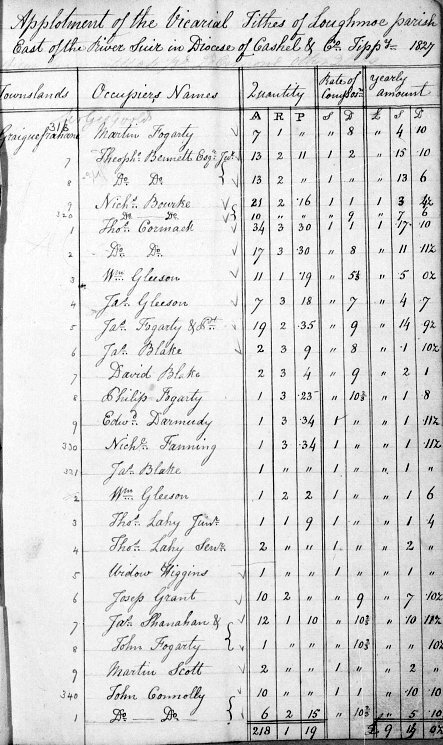 They had seven children. He was a farmer with 280 acres in Delavan. 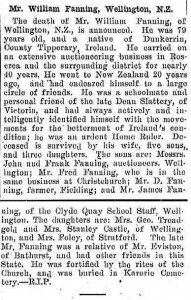 “Michael Fanning, farmer and stock raiser, sec. 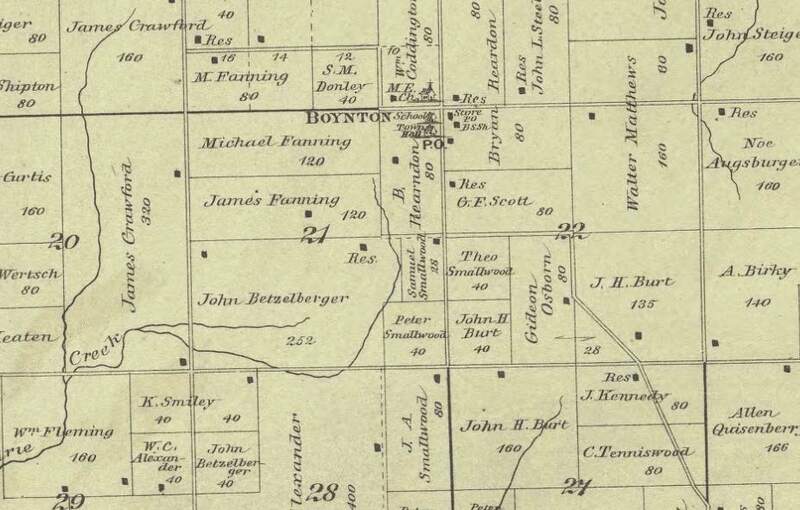 16 ; P. O. Boynton. 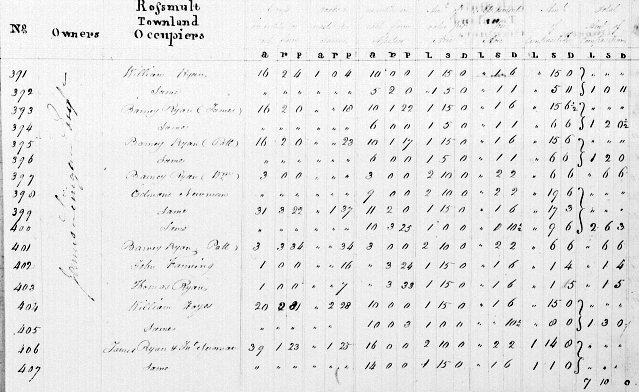 about 25 inhabitants, mostly Frenchmen and Southerners. 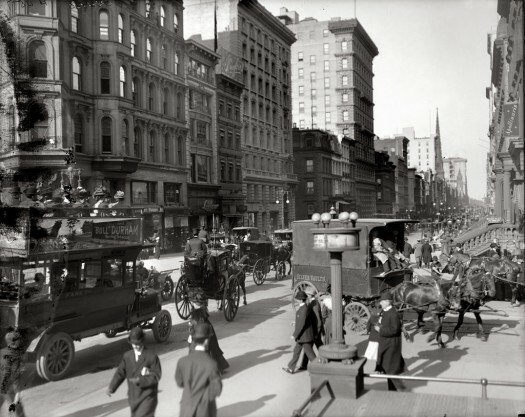 Mr.
others, many of whom have passed the dark river. 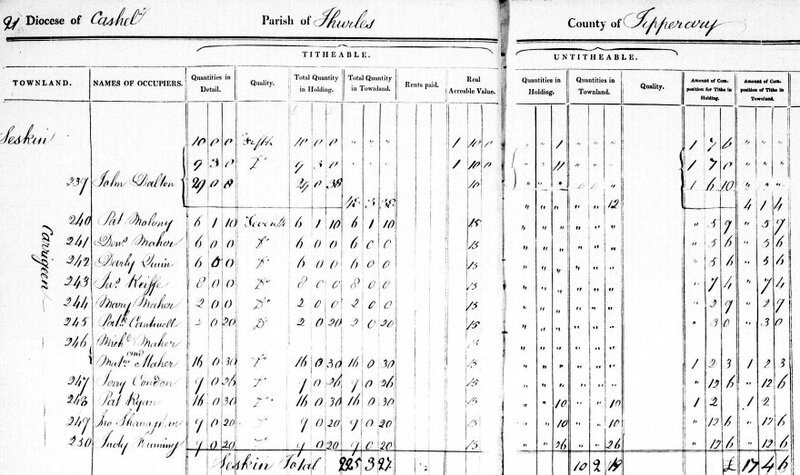 In 1851 Mr.
ing to Tazewell Co., he again worked as a farm hand for a time. 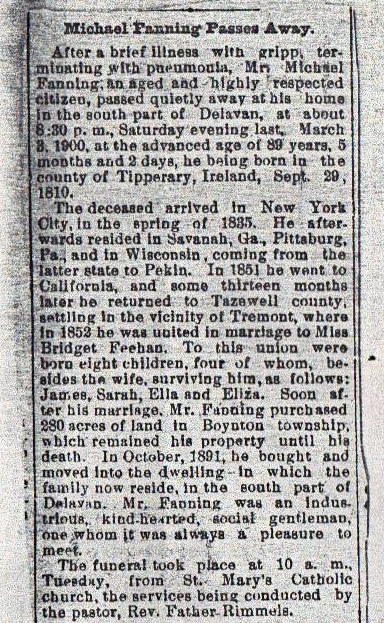 In 1852 he was married to Miss Bridget Ann Phean, of Ireland. During this year Mr, F. leased property until enabled to purchase. 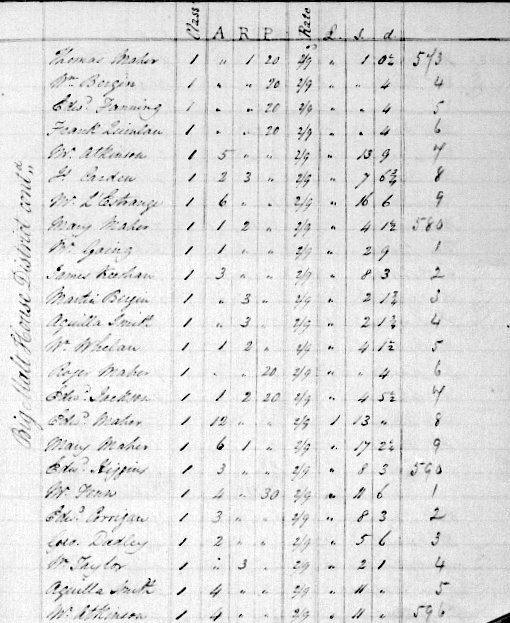 1837 being the year he arrived in Tazewell county. 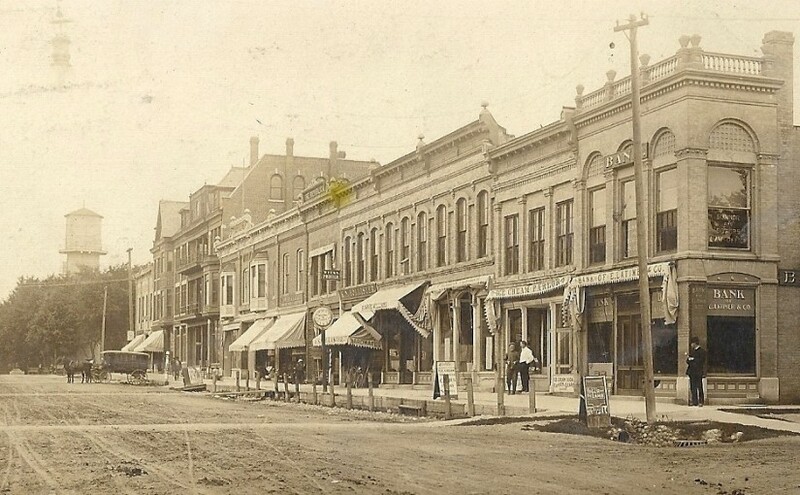 James F Fanning born 25 Nov 1851 Delavan, married Mary Mack, died Peoria Illinois 16 Mar 1925. 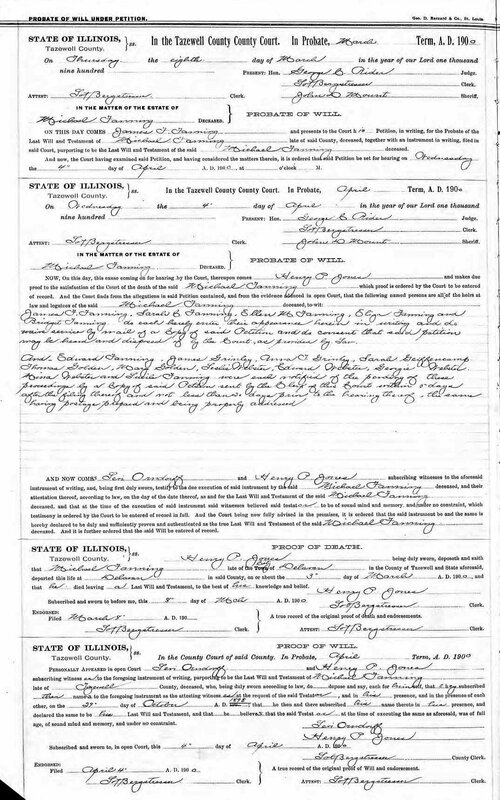 Mary A. Fanning married Charles Byron Webster 1 Mar 1881 in Boynton Tazwell Ill. She died in Rantoul Illinois 3 Nov 1888. 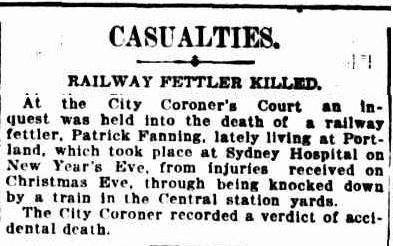 Elizabeth Fanning died 16 Feb 1932 in Chicago Cook County. 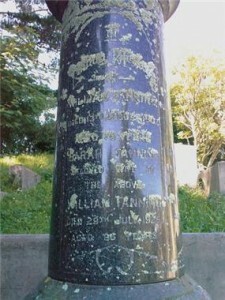 John F Fanning who was born 6 April 1856 died 21 June 1868. Sarah C Fanning born 10 June 1860 died 13 Mar 1903. Thomas Fanning born 13 Feb 1859 died 20 Oct 1898. 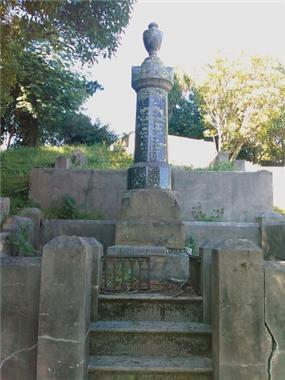 William born 31 Aug 1854 died 1 Nov 1885. 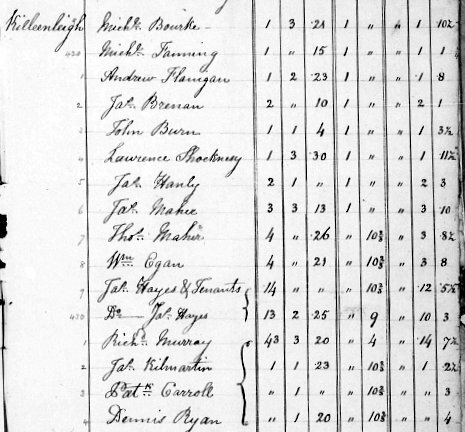 With the exception of Elizabeth they are all buried in St Mary’s Catholic Cemetery in Delavan. 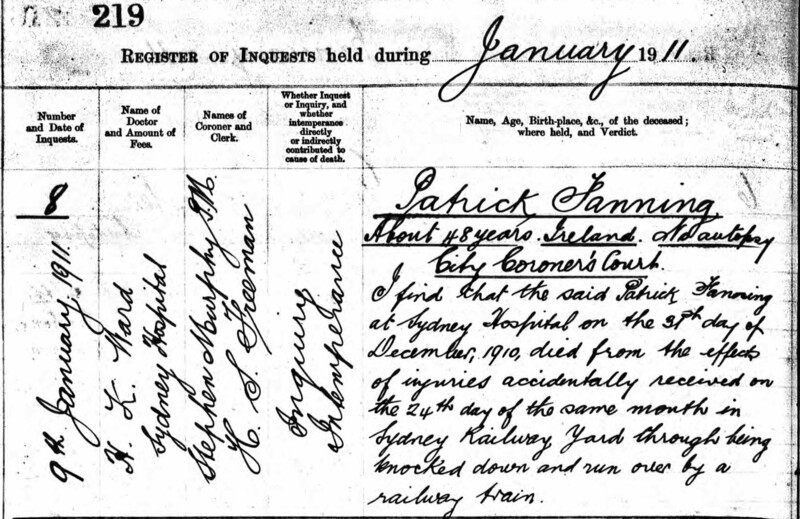 Brian Brophy has kindly sent me a copy of the probate papers for Michael Fanning. 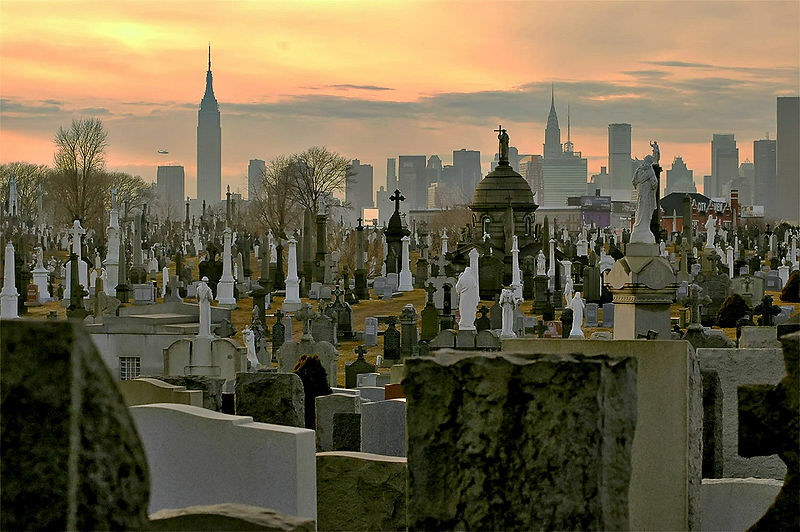 So far a death certificate for Michael has not been found. 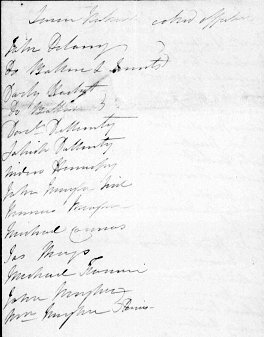 Brian Brophy believes that the Edward fanning who was sent a notification of the probate is his gggrandfather. 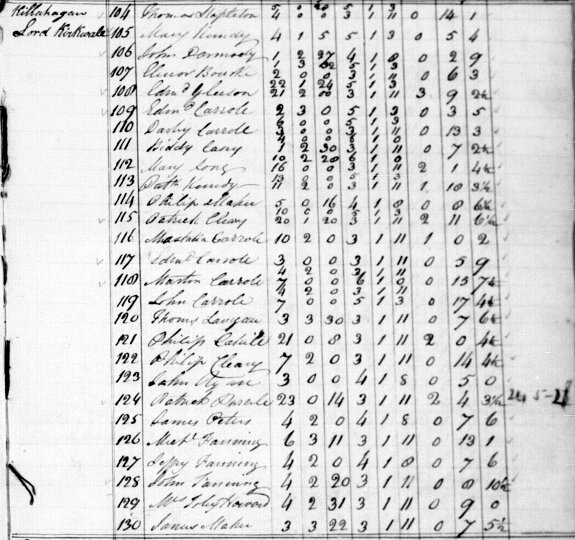 Michael Fanning born 29 Sept 1810 died Tazewell Illinois 1900. St Mary’s Cemetery Delavan Illinois. 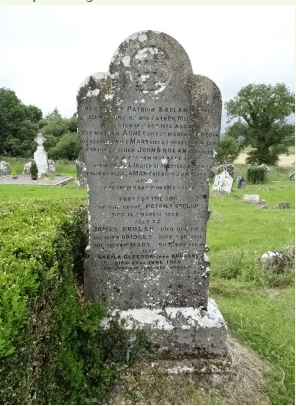 My gggrandfather’s brother was a Michael Fanning born in Thurles Parish to Edward Fanning and Judy Darmody on Sept 23 1810 whereas the above gravestone has 29 Sept. 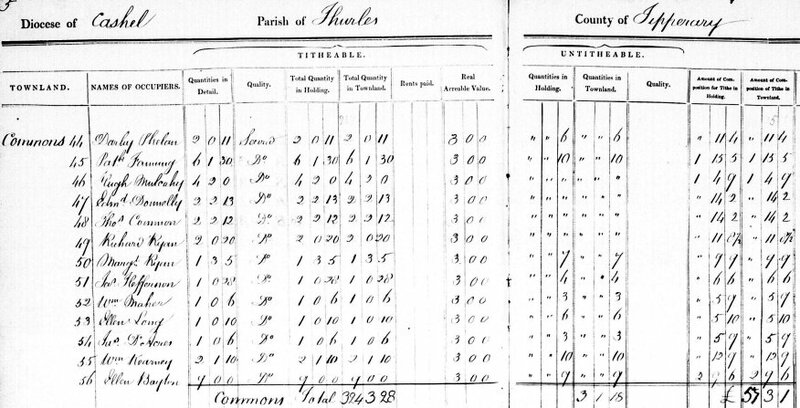 This record was from a typed book transcribed from the original parish registers at some stage. The 23 could easily be a 29. 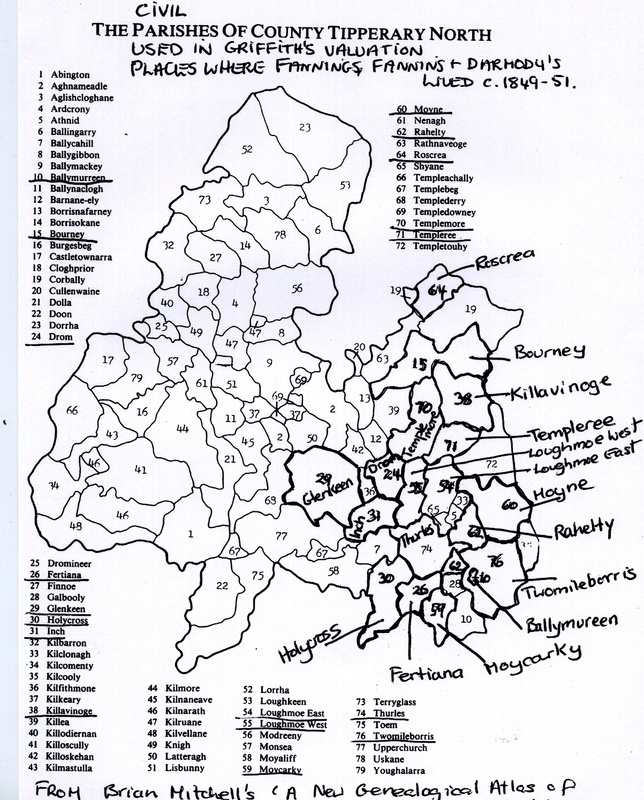 I have asked Tipperary Family History Research to check the microfilm if one exists. 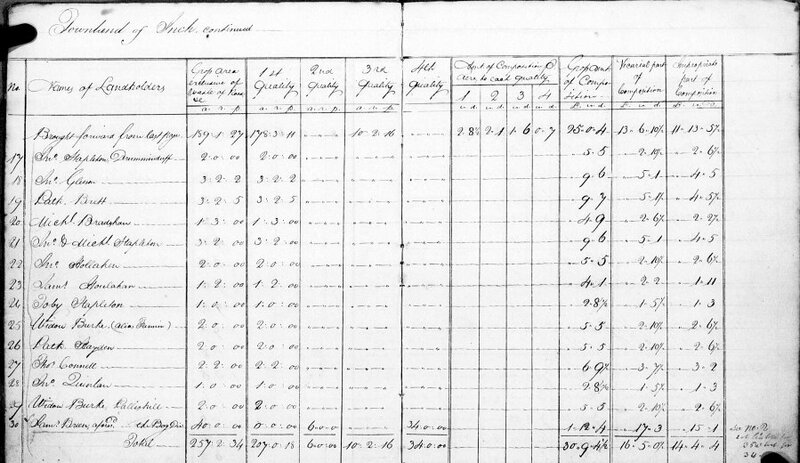 TFHR got back to me after checking the microfilm entry and it is clearly 23 of Sept. I would love to hear from anyone who can add more to this story and verify the connection. 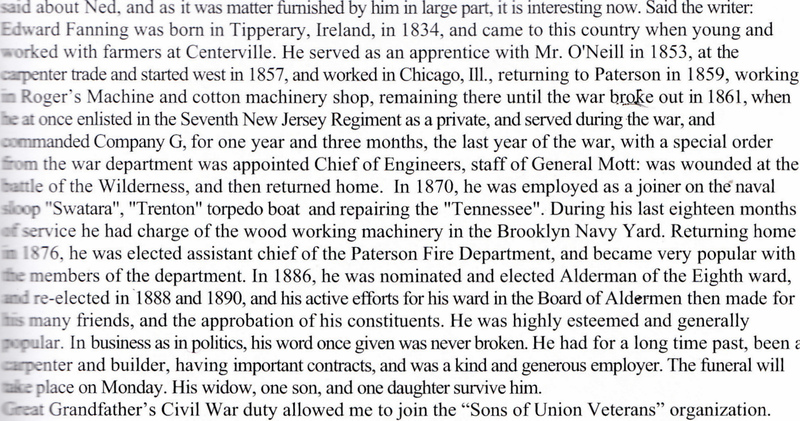 Posted on November 22, 2012 May 16, 2018 Categories Fanning/Fannin, Related Irish FamiliesTags Boynton, Delavan, Feehan, Illimois, Keyes, New Jersey, Paterson, Phean, Tazewell6 Comments on Michael Fanning of Boynton & Delavan Tazewell Illinois, brother of William “Big Bill” Fanning?